Madhubala was one of the most beautiful, enigmatic and successful Bollywood actresses of the 1950s. With this biography, explore the childhood and profile of Madhubala. Madhubala was one of the most talented, most popular and most successful Bollywood actresses of the 1950s and early 1960s. Born with the combination of exceptional beauty and impressive talent, she went to become one of the leading stars of her time. Such was her beauty that she was hailed as ‘Venus of the Screen’, by her fans as well as the media. She is often compared to Marilyn Monroe and holds quite a similar position in the Indian film industry. In a 1990 poll conducted by Movie magazine, Madhubala was voted as the most popular Hindi actress of all time, garnering 58% of the votes. Madhubala was born as ‘Mumtaz Begum Jehan Dehlavi’ on 14th February 1933, in Delhi, India. She was born into an ethnic Pathan family and was the fifth amongst the eleven children of Ataullah Khan. Within a few years of her birth, her father lost his job at the Imperial Tobacco Company. Following this, the family had to face many hardships, even the death of four of her sisters and her two brothers. This left the family with Madhubala and her four sisters as the only children. In order to gain employment, Ataullah Khan relocated to Bombay. Madhubala entered the film industry when she was hardly nine years old. Madhubala bagged the first role of her career in ‘Basant’ (1942), which turned out to be a hit. In the movie, she played the daughter of Mumtaz Shanti. Following this, she acted in a number of films, as a child artist. Devika Rani, one of the most popular actresses of her time, got impressed with the talent and potential of Madhubala and advised her to change her name, from Mumtaz, to Madhubala. 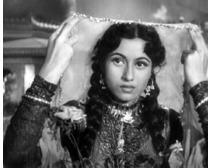 With time, Madhubala gained the reputation of a dependable and professional artist. Her exceptional beauty and lissome figure also ensured that she was looked upon as one of the stars of the future. Madhubala played the first lead role of her career in Kidar Sharma’s ‘Neel Kamal’ (1947), in which she was paired opposite Raj Kapoor. It was also the first movie in which she was credited as Madhubala, not Mumtaz. Even though the film failed to create any magic at the box office, it served as a platform for the recognition of her talent. The next year, she starred in a number of films, namely ‘Parai Aag’, ‘Lal Dupatta’, ‘Desh Sewa’ and ‘Amar Prem’. However, none of them did much to promote her career as an actress. It was in the year 1949 that success finally came Madhubala’s way. She starred in Bombay Talkies production, ‘Mahal’, opposite seasoned actor Ashok Kumar. The film went on to become a major success and established her as a star. She was applauded not only for her talent, but also for her enigmatic screen presence and beauty. Following ‘Mahal’, Madhubala was seen in a number of successful films. However, since she came from a humble background, Madhubala did numerous films in the initial years to secure herself and her family financially. This resulted in her appearing in a number of nonsensical films also. The media dubbed her as an actress with more beauty than acting ability. Still, Madhubala was seen in a number of applauded films. In the 1950s, she was seen in films belonging to almost every genre, establishing her as a versatile performer. On one hand, she was seen as archetypal lady in ‘Badal’ (1951), on other, she also essayed the role of an outgoing village belle in ‘Tarana’ (1951). Her role as traditional Indian woman in ‘Sangdil’ (1952) contrasted with that of a spoilt heiress in ‘Mr. and Mrs. 55’ (1955). Not to be forgotten is her double role in ‘Kal Hamara Hai’ (1959), where she played two entirely opposite characters. In the mid-1950s, Madhubala suffered from a string of flop films, including Mehboob Khan's ‘Amar’ (1954). However, she managed to come back and retain the top slot, with films like ‘Howrah Bridge’. In the movie, she played the unusual character of an Anglo-Indian Cabaret singer, which required her to don a daring (for that time) Westernized image. The film was followed by other successes, including ‘Phagun’, ‘Kala Pani’, ‘Chalti Ka Naam Gaadi’ and ‘Barsaat Ki Raat’. The 1960s saw her performing in hits like ‘Mughal-E-Azam’, which proved to be the crowning glory of her career. Her last film was ‘Jwala’ (1971). Madhubala suffered from a cardiac defect known as ‘hole in the heart’, right from her birth. However, the condition remained undiagnosed till 1950, when she was frequently seen coughing blood on the sets. Even after her condition became apparent, she continued working in films with the same dedication and professionalism. Madhubala’s illness was one of the reasons why her family was so protective of her. While on sets, she used to have home prepared food and drink water that came from a specific well. It is believed that the stresses involved with shooting also played a role in accelerating her ill-health. In 1960, Madhubala went to London, to seek treatment for her illness. However, at that time, complicated heart surgery was still in the initial stages. Doctors refused to operate on her and advised her to rest and avoid overexertion. Madhubala returned to India and started working in films again. Though her condition continued to deteriorate, she tried working opposite Raj Kapoor, in the film ‘Chalack’. Within days, she fell seriously ill and the film got shelved. Madhubala also tried venturing into direction, with the film ‘Farz aur Ishq’. The film was not to be, as Madhubala succumbed to her illness during the pre-production stages and breathed her last on 23rd February 1969. Madhubala was involved in a romantic relationship with co-star Dilip Kumar. They first met on the sets of ‘Jwar Bhatta’ (1944) and went on to do ‘Har Singaar’ (1949) together. However, it was only during the filming of ‘Tarana’ (1951) that they entered into an off-screen relationship. Madhubala was a very reserved person and hardly made public appearances or gave interviews. Though rumors of her affair with Dilip were doing the rounds, it was only when she appeared for the premier of his film ‘Insaniyat’ (1955) that they got confirmed. Being escorted by Dilip Kumar, she had publicly acknowledged the relationship. The romance between Madhubala and Dilip Kumar lasted five years, between 1951 and 1956. It ended with a court case, involving B.R. Chopra and Ataullah Khan. Madhubala and Dilip were acting in Chopra’s film ‘Naya Daur’, for which they had to travel to Bhopal for an extended outdoor shooting. Ataullah Khan objected to it, saying it was a ruse to let Dilip Kumar romance his daughter. Chopra sued Madhubala for the cash advance for the film and Dilip Kumar testified against her. The case caused much negative publicity to Madhubala and also ended her affair with Dilip Kumar. Madhubala met Kishore Kumar during the filming of ‘Chalti Ka Naam Gaadi’ (1958) and ‘Jhumroo’ (1961). At that time, he was married to actress Ruma Guha Thakurta. Soon after, he got divorced and married Madhubala, in a civil wedding ceremony in 1960. Since Madhubala was a Muslim, Kishore’s family refused to accept her. The couple also had a Hindu ceremony, but it failed to please Kishore’s parents. Madhubala was never accepted as his wife and within a month of her wedding, she moved back to her bungalow in Bandra. For the rest of her life, Madhubala could never enjoy the true happiness of matrimonial life. Madhubala was one of the most successful actresses in India, in the 1950s. Her talent and beauty also attracted interest from Hollywood. She was featured in a number of magazines, like ‘Theatre Arts’. The magazine devoted an extensive article to her, with a full page photo titled - ‘The Biggest Star in the World (And She's Not in Beverly Hills)’. During that time, American filmmaker Frank Capra came to Mumbai and was pampered by almost all the elite stars of Bollywood, except Madhubala. He also proposed a meeting for discuss an opening for her, but it was declined by her father. This was the end of her likely Hollywood career.